Andrea Lee Smith takes the stage, with a special evening of music for flute, featuring works by American Indian composer, G. Wiley Smith, George Crumb’s iconic Vox Balanae, and a world premiere performance of Mother Earth by Erin Rogers, for flute, saxophone quartet and electronics. Andrea has gained a reputation of thrilling her audiences with groundbreaking instrumental performances incorporating costume and choreography, including work with Pilobolus alum, and a feature solo performance on the 2013 television season of All-Star Celebrity Apprentice. Her debut recital will feature works from past, present and future with the help of Meaghan Burke, Tristan McKay and the New Thread Quartet. Mother Earth was made possible by a grant from the American Composers Forum with funds provided by the Jerome Foundation. 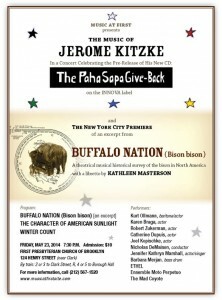 A concert celebrating the pre-release of his new CD, The Paha Sapa Give-Back on the Innova Label and presenting the New York City premiere of an excerpt from Buffalo Nation (Bison bison), a theatrical musical historical survey of The Bison in North America with a libretto by Kathleen Masterson. I have been highly connected to Kitzke’s Buffalo Nation, having engraved and edited the parts of this work (published through Peermusic Classical). On the 23rd I will be performing as part of the Sound Effects Chorus, a “herd” of vocalists/body percussionists. This piece is not to be missed! Also on the program is ETHEL and The Mad Coyote. The Immediacies Series continues with an evening of contemporary vocal music from the Quince Contemporary Vocal Ensemble and thingNY’s Gelsey Bell. Quince previews their upcoming album, Realign the Time, with Amanda Feery’s “Squarepushers” and solos, duos, and trios by David Lang, Giacinto Scelsi, Lisa Bielawa, and Monte Weber. Gelsey Bell presents her 2011 song cycle SCALING, which explores the relationship between vocal performer and piano, with fellow thingNY compatriot Paul Pinto. Both groups of artists offer diverse approaches to contemporary music anchored in the voice. 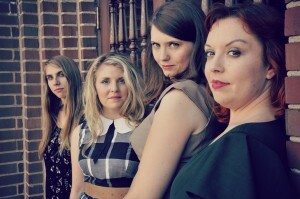 New Thread Quartet is excited to be performing at Bang on a Can’s Summer Festival Benefit Party! We will be performing Microfluctuations in Plainchant for sax quartet and electronics, a piece by Summer Festival alumnus Daniel Wohl. New Thread Quartet is headed to the Learning Community Charter School in Jersey City to present an outreach program for middle school students.